Looking for a healthy quinoa recipe or wondering what's the best way to cook quinoa? Look no further! Here is a favorite, fabulously easy and healthy whole grain Warm Vegetable and Quinoa Salad. 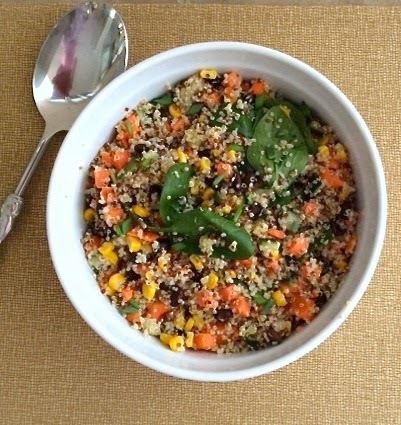 A versatile quinoa salad recipe, it's got carrots, corn, black beans and spinach. It's simple enough to pull together quickly and high in healthy protein. Perfect for vegetarians and vegans, and, this quinoa salad recipe is naturally gluten-free as well. Heat the oil in a large saucepan over medium-high heat. Add the garlic, onions and carrots and cook, stirring occasionally, until softened, about 5 minutes. Add the broth, and quinoa and bring to a boil. Reduce the heat and simmer, covered, until the liquid is absorbed and the carrots and quinoa are tender, 15 to 20 minutes. Add the black beans, corn and gently stir in the spinach cooking it until it just begins to wilt, 2 to 3 minutes. Remove from the heat. This vegetarian and vegan dish can be served fresh and warm or chill in the refrigerator before serving to allow the flavors to develop.Toss it gently before serving.